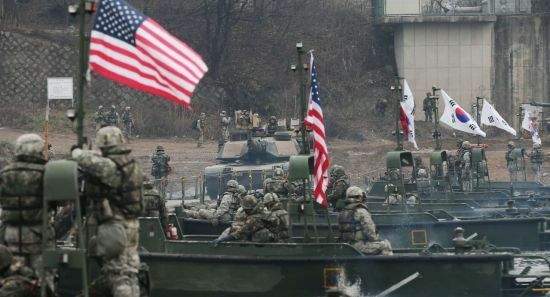 A North Korean propaganda outlet called for an end to all military exercises between the United States and South Korea, after the US defense chief suggested the possibility of scaling back a joint exercise set for next spring. US Defense Secretary James Mattis told reporters on Wednesday that the springtime Foal Eagle exercise will be "reduced in scope" and that it is being "reorganized a bit" to keep it at a level that will not harm diplomacy with Pyongyang over its denuclearization. Foal Eagle is one of major annual exercises that the South and the US have conducted to bolster preparedness against North Korean aggression. But Pyongyang has long denounced these drills as a rehearsal for invading the country. On Sunday, Meari, one of the North's propaganda websites, said in an article that such "war exercises," regardless of scale, are bound to raise tensions and must be halted altogether, and that as long as such drills take place, there can't be peace on the Korean Peninsula.